Morzine is a picturesque, traditional alpine town located in the heart of the Portes Du Soleil ski area in the French Alps. With a recognised ‘micro-climate’ over Morzine, a result of it’s location half way between Mont Blanc and Lake Geneva, the area benefits from colder temperatures at lower levels and encourages more frequent snowfalls throughout the winter season. Morzine and Avoriaz are right in the heart of the expansive Portes du Soleil area which spans across France and Switzerland with 12 resorts. The resort has a fantastic snow history from December to April. There is enough variety across these resorts to entertain both beginner and advanced skiers and snowboarders during the week. Avoriaz boasts a world class Burton-sponsored terrain park ‘The Stash’ as well as numerous freestyle parks and half pipes. There is also a host of other activities and things to enjoy in winter such as: Cinemas, ice-skating, spas, indoor heated pools, torchlight descents, weekly fireworks, ice hockey, skidooing, tobagonning, sledging, snow shoeing, parapenting and canyoning. 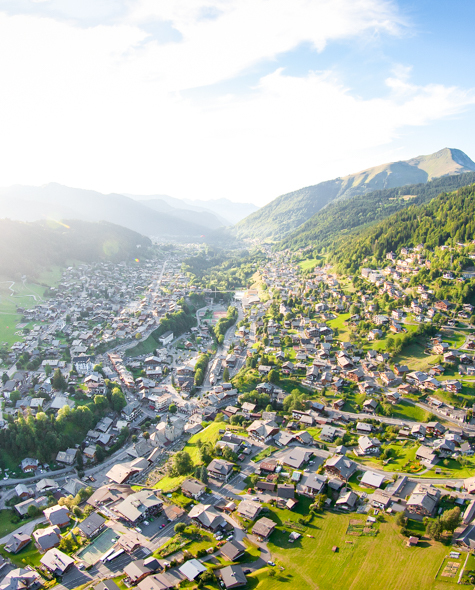 Once the snow has melted the summer begins and Morzine has even more to offer. With the lifts running in the summer time the resort opens again offering some of the most famous mountain biking trails in the world. There are also many other family activites to be enjoyed: Walking, parapenting, climbing, horse riding, rafting, kayaking, fantasticable, summer luge runs, devil karting, sunbathing by the pool and much much more. Morzine offers mountain bikers some of the world’s best mountain biking terrain, boasting up to 380kms of marked trails with varying degrees of technical skill required. With such variety on offer, Morzine has been proud to be a venue for the Tour de France and host to UCI mountain bike World Championships. Road cycling in and around Morzine boasts some of the best climbs and views to be had in the French Alps. The ‘Dereches’ walkway / cycle path down by the river passes the swimming complex, tennis and badminton courts. There are pony and horse stables where even little 3 year olds can learn horse-riding. The Dereches has a great climbing activity area, a zip wire, a toddler playground and great picnic spots. Morzine also has a weekly local market, a cheese factory and is close to Annecy, Yvoire (a beautiful medieveal village), Thonon, Montreux, Evian Les Bains, and Lac Leman for days out. Lac de Montriond is also a beautiful spot for picnics, kayaking, ice-diving (in winter) and is becoming very popular for weddings at Domaine De Baron due to it’s absolutely stunning backdrop. The lake hosts an amazing fireworks display and evening of entertainment every August when people come from all over France to join the celebrations. With many restaurants, bars and a few night clubs, Morzine’s reputation for apres-ski has increased dramatically over the past 10 years, playing host to great DJ’s and famous bands, our facebook page is updated regularly with news of upcoming events! It truly is an amazing place to visit (and live in!) all year round.